The May 2012 Reynolds OI.v2 Sea Surface Temperature (SST) data through the NOAA NOMADS website won’t be official until Monday, June 11th. Refer to the schedule on the NOAA Optimum Interpolation Sea Surface Temperature Analysis Frequently Asked Questionswebpage. 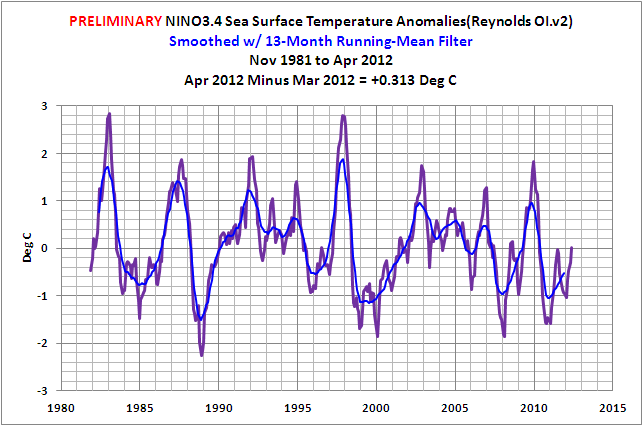 The following are the preliminary Global and NINO3.4 SST anomalies for May 2012 that the NOMADS website prepares based on incomplete data for the month. I’ve also included the weekly data through the week centered on May 23, 2012, but I’ve shortened the span of the weekly data, starting it in January 2004, so that the variations can be seen. 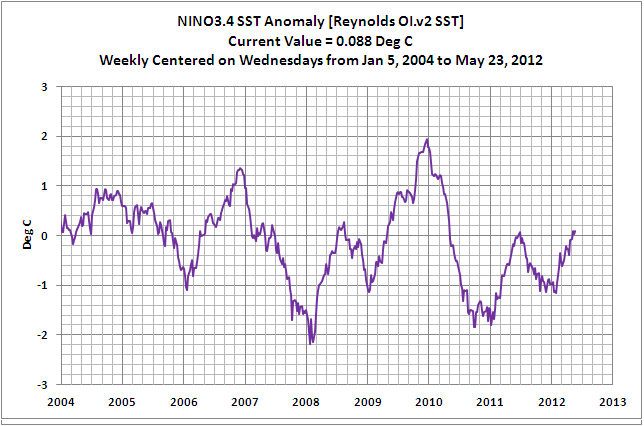 Based on the preliminary data, monthly NINO3.4 SST anomalies are at +0.013 deg C. Will there be an El Niño this ENSO season, or will Mother Nature defy the models and go for a triple-dip La Niña? 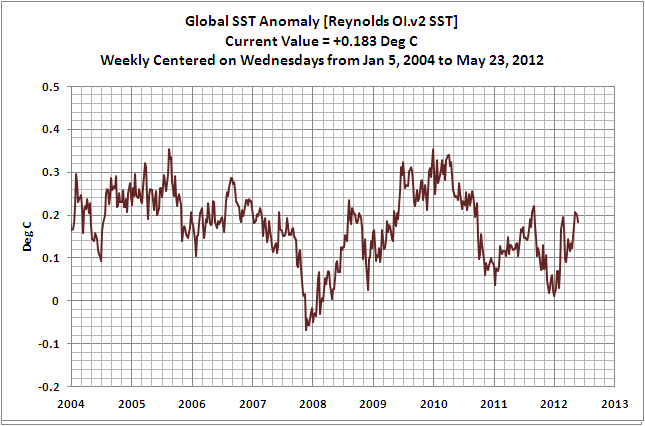 The preliminary global SST anomalies have rebounded quite a bit in the last month. They’re presently at +0.203 deg C.
The weekly NINO3.4 SST anomalies for the week centered on May 23, 2012 are well with ENSO-neutral range (-0.5 to +0.5 deg C). In fact, they’re above zero. They are now at +0.089 deg C.
Weekly Global SST Anomalies are wiggling their way warmer, a rise one week, followed by a drop the next, with the rises exceeding the drops. They are presently at +0.183 deg C.
INTERESTED IN LEARNING MORE ABOUT THE EL NIÑO-SOUTHERN OSCILLATION? About one-quarter of my book If the IPCC was Selling Manmade Global Warming as a Product, Would the FTC Stop their deceptive Ads?, Section 6, is about the processes that are part of El Niño and La Niña events. Many of the discussions are rewordings (expansions and simplifications) of my posts here at Climate Observations, so you could save a few bucks and read dozens of posts. But the book provides a single resource and reference for you and includes a very basic, well-illustrated introduction to El Niño, La Niña, and ENSO-neutral conditions written in simple terms. Included in that section are discussions of how La Niña events are not the opposite of El Niño events and how and why certain parts of the global oceans warm in response to certain El Niño AND to the La Niña events that follow them. The El Niño-Southern Oscillation is a marvelous process Mother Nature has devised to enhance or slow the distribution of heat from the tropics to the poles. It is process that naturally varies in intensity, and due to those variations, it is capable of warming or cooling global temperatures over multiyear and multidecadal periods. The individual chapter titles of Section 6 will give you an idea of the topics discussed. See pages 9 and 10 of the introduction, table of contents, and closing of my book in pdf form here. Hello Bob. It seems that I have remained firmly in the lunatic fringe of climate science. Suggesting the the droughts in Sub Saharan Africa will also mean less cloud and moisture pulled westward over the Atlantic, allowing for increased insolation at a rate consistent with the published data for CC. If you were to take seperate monthly mean values: 1870 to 1930 against mean 1931 to 2010, you will find such a migrating ocean warming pattern entirley consistent with the above fact (10S to 20N). Further conclusions can be drawn by translating said warming into watts/m3, preferibly subtracting one months figures from that of the succeeding month, then devide by the days of the month. One should also note that this warming pattern is only found off the coast of W Africa and not on it eastern seaboard. The resultant figure is again consistent in timeframe, magnitude and location with the above fact. Whole forrests are being cut down to provide papers on the subjects of climate, deforrestation and SSTs. But the elephants in the living room which are heroically and studiously being avoided is that There is a very large shallow warm freshwatter lake has shrunk then dissapeared in Africa, that Rainfall downwind of said lake has varied consistent with the man made size of said lake, and lastly the SST of the W African coast has simmilarly varied inversley with the reduced cloud/moisture flux from the Sahel. The big question here is why has it been virtually impossible to gain access to the relevent WRFs for such an obvious scenario: I produced the background material but am totally lost therafter for any honest and credible explination for this oversight, particularly when understanding the problem provides for a very cheap and user friendly goe-engineering solution? The Excel linear fit gives a slope of about 0.37C per decade. I wonder if you can take a quick peek and comment? Thanks. Correction – 0.1C per decade! (trying 365 days per year not 1365). Sorry. BillC: Why are you using the absolute data? Try it with the anomalies. I didn’t see where I could get the anomalies as a gridded product, by lat and long. So I downloaded the netCDF files from the NOAA website at http://www.esrl.noaa.gov/psd/data/gridded/data.ncep.oisst.v2.html. I got the monthly means, applied the land mask and created my own anomalies. Here is a plot of my anomalies vs. the UAH anomalies – I was interested to see how they compared. If you have an online data source for the global monthly anomalies I can plot mine to make sure I did the global averaging correctly. Once again I got a trend of just under 0.1C/decade for the satellite SST where UAH is showing 0.11 for the global lower troposphere ocean component. Select “ssta” for the anomalies from the “Field” drop-down menu. The default coordinates should be for global, so click “Plot”. That’ll open a new page with a graph. Below the graph, to the left, click on “Download data file for maskout(sst-273.15,mmask-1)”. 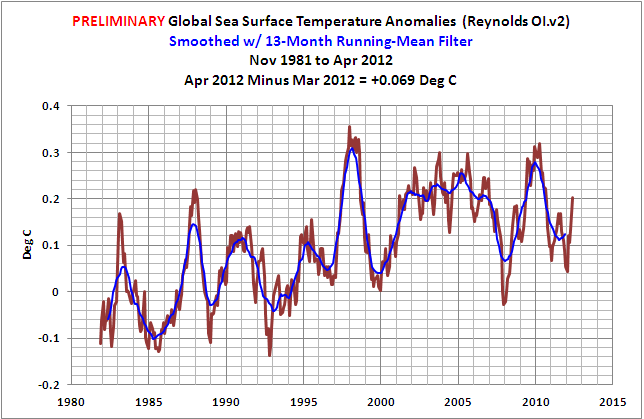 That’s the global sea surface temperature anomalies starting in November 1981. You’ll need to include the months and years yourself, but input those as years plus decimal points. That is, November 1981 would be 1981.8334. December 1981 is 1981.9166. January 1982 would be 1982.00. February 1982 as 1982.0834. March 1982 as 1982.1666 and so on. Something to that effect. That will make the x-axis easier to work with. They provide the months and data. Thanks, I went to that page and downloaded the data as you suggested (anomalies, but also the absolute temps. I noticed some discrepancies so I went back and looked at my calculations and I had made a mistake in the global averaging. Now when I plot my time series it matches the graphs that display online. FWIW now I get a global trend of 0.08C/decade. Bill: 0.084 deg C/decade is what I get also. Can someone comment on the post in Climate Progress regarding Global Ocean Warming.